Last night, Jonathan Ross together with guests Stephen Fry, Amy Poehler and Romesh Ranganathan, and the audience were treated to the elephant scene as previously shown on the Jimmy Kimmel Show earlier in the week. In the interview with Sacha told Jonathan Ross about the time he came across ‘the worst Neil Diamond impersonator in the world,’ while visiting a pub in Grimsby. 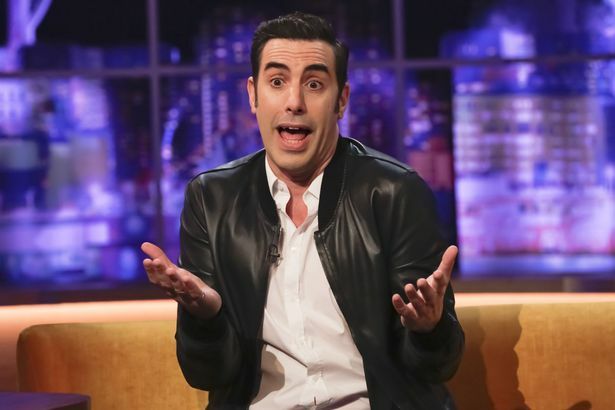 “The idea was to have a James Bond character and we thought who would be his ideal brother,” Sacha Baron Cohen said of the new film. “And we spent a bit of time up in Grimsby and in the north of England. Originally he was going to be a kind of football hooligan. UK readers can watch the full episode on ITV Player here for the next 29 days.